Enterprise and Fortune 500 clients have called on Wiideman Consulting Group for strategic planning for over a decade. Our organizational style is simple, our recommendations are intuitive and our project planning is actionable, creating a streamlined plan for long-term growth in search. 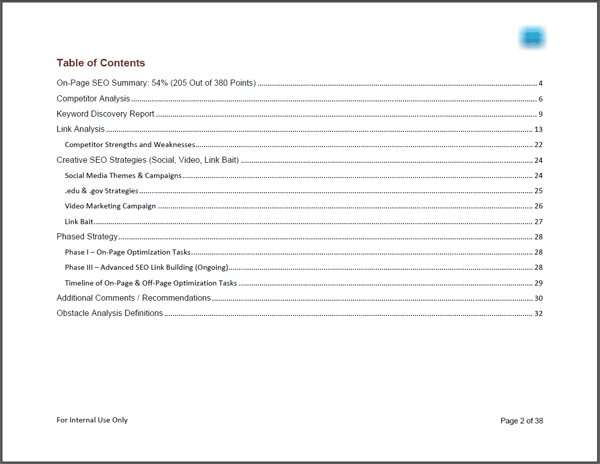 Below is a screenshot of a table of contents from one of the SEO Strategic Plans I’ve written. Topics and focal points will be based on your individual need and may have more emphasis on current technologies and platforms, such as mobile. We’ll manually review your website to look at specific SEO criteria such as site structure, site maps, page speed and cross-browser/cross-device compatibility. We’ll look at titles, descriptions, robots.txt, redirection and more. The full audit includes over 40 criteria, including location-based SEO criteria (if applicable). BONUS! Nearly every criterion reviewed includes a video tutorial describing the attribute, the reasons it might be important to SEO and resources to help you resolve the problem. Our search engine optimization assessment includes an exhaustive list of on-page and off-page audits. We price this full audit based on the long-term value it has provided to clients we consult with regularly and from the data post-implementation, we know it’s worth the cost. The audit includes emphasis on mobile optimization, website speed, social signals, page optimization and linking patterns (among other criteria). Each row of our audit includes the resource who should be working on the focal point, Google’s view on the topic, the resource to test with and a two to 10-minute video of us walking you (or your team) through the item in detail. Call (562) 732-4417 to learn more. Give us the opportunity to provide a complimentary review of your current SEO at no cost. Keep in mind that this is a site review, not an audit, but we hope to give you enough information to get started with SEO.